In association football, I'm confused as to how the referee is expected to indicate an indirect free kick at the time of the offence. He spots the offence, blows his whistle, and then he needs to indicate which team is awarded the free kick by raising his arm at a 45° angle pointing towards that team's attacking side. At that point, i.e. way before the kick is about to be taken, does he also need to indicate that the free kick is indirect with an arm raised vertically or does he only indicate indirectness when the kick is about to be taken ? I'm assuming he would not raise both arms at once. This video didn't make that clear to me. My understanding from this video is that the referee would have his arm raised vertically from the moment he awards the free-kick up until when the ball is played and touched by another player. This makes no sense to me since in the meantime the referee might need to deal with objection or wall-placing, or may simply need to wait for a ball to be provided. I also have the feeling that when an off-side offence is called, the referee signals it differently from other indirect free-kick offences. I can't find a video on Youtube where the referee is actually on the screen at the moment the off-side is called, but I seem to remember that they immediately raise an arm vertically, without indicating which team is awarded the free-kick. Granted, if it's an offside, then there's no confusion. But I'm pretty sure that in other cases, like in an obstruction offence, the referee would indicate which team it goes to, and indicate indirectness later on ? Blow the whistle and award that free kick as you usually would do. You'll have to resume the game by blowing the whistle again. So you do not have to keep your hand raised all the time. Remember to tell the player to wait for your whistle by telling him to wait and pointing to your whistle with the other hand (visible to everyone). 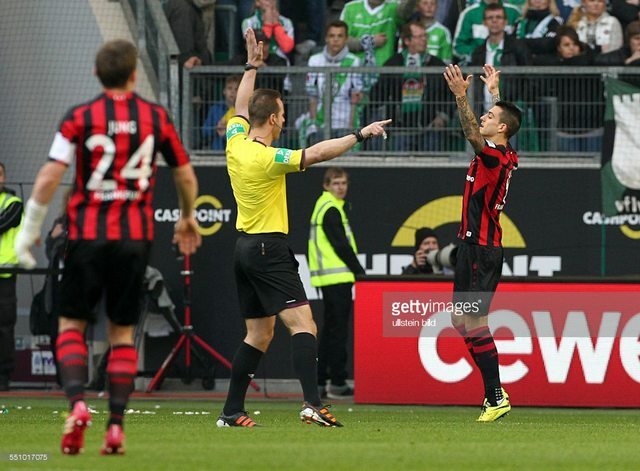 When you're ready to resume the game, raise your hand to signal the indirect free kick and blow the whistle to let the player take it. Talk. If the players are unsure about what to do, tell them. A good communication is the key to prevent a lot of problems. Offside signals may be different from the usual indirect free kick signals. Our referees are indicating offside by raising the arm (for indirect fk) and waving the other arm in front of them in a line parallel to the goal line. This plus the linesman's flag signal is sufficient to signal offside offenses.